Wiah, my neighbor who was one of my visitors, called to the man in the motor canoe. The man pulled towards my house’s front deck and tied the canoe rope to one stilt of the house. “How much is the fish?” Wiah asked. “Ten for three,” he answered. Nothing were unusual with one dollar for three fish of a palm size if Wiah had not been a Bajo—the sea nomad groups scatter between East Borneo and Moluccas—of Togean Islands. What surprising me more, later, is we can get six fish for one dollar in Ampana, the harbor town on the mainland of Sulawesi, four-hour cruise by ferryboat from we were now. The Bajo lives on the ocean and they catch marine creatures around their house, but now they have to buy fish with the price higher than the ones in the urban mainland! I saw fish swimming around in the water below my host’s house; they had various forms and colors—beautiful—but similar size: between 2 to 10 centimeter. The sea urchins and pale white with orange-tinted starfish spread among the grey to black coral reefs; these creatures are the indicators of unhealthy reefs. I could only see colorful coral reefs and bigger fish after rowing two hours from the village; even so, the number and size of fish is mediocre, most of them are less than 30 cm long. The people of Tangkian village settled here about ten years ago. They came from the villages near Katupat, the largest village in the area, for the reason there had not been enough fish around their old villages—I believe the cause is both over-population and over-fishing. They must have chosen Tangkian for its abundance of fish and other marine creatures. They did not even mind to bring fresh water every alternate day from the forest: two-hour rowing and one-hour trekking to the spring. “We used to sit in front of our house with a fish pole to have our meal, or just spread a fish net in the evening and harvest the fish and shrimp in the following morning,” they said. It is a history. The population of Tangkian Island (only one village on it) is around 120 people. Did they really consume marine creatures so much, depleting the sea around, within less than ten years? Everybody knows Asrin, my host, does not smoke because all other men in the village do. Every household, except Asrin’s, spends $50 to $100 per month on cigarettes only—20 to 40 cigarettes per man/day. Almost every adult has a cellular phone. And every house has a music player, some a video player—the ones with a TV set, a huge satellite dish outside, and a generator for operating the TV and video. If only for their meal and other basic needs, the Tangkian people would not deplete rapidly the sea around them. In order to fulfill their ‘modern’ needs, they have to catch and kill more everything living in the sea. With traditional methods, they could not do so, but with dynamite and poison (cyanide? ), they can. The blasts crush the coral reefs, killing every creature (coral is alive, remember) inside and around at the time of the explosion. Very bad indeed—corals are the main home of the fish and other marine-life in the shallow ocean—but poison devastates much more. Blasting causes only local destruction—and personal injury to the blasters who are not quick enough—but poisoning will kill everything alive, from tiny planktons to gigantic turtles, kilometers away from the spot where the poison dumped. “The poison blackens the corals,” some people told me. I am sure they also know that the poison kills everything kilometers away. It does not need a researcher to correlate the disappearing fish to the blasting/poisoning. What drives them do the destruction? Every evening the people gather in front of the TVs—operated by a genset that consumed 3 – 4 liters fuel, around $7 per night. I notice that the most favorite program is cinetron, the soap opera of Indonesian version. It mainly shows the lifestyle of the upper class Indonesians in urban areas: living in luxurious house, driving expensive car, dining in fancy restaurant, staying in 5-star hotel, etc. The cinetron creates a dream and felt need to the audience. “How much is the airfare to Jakarta,” some of the villagers asked me. They think Jakarta is like in the cinetron. I was wondering how they look when looking at the slums in Jakarta. 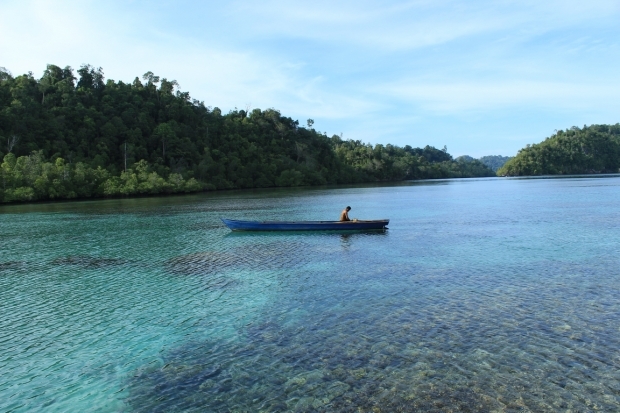 Except for the practices of blasting and poisoning, the Togean Islands is still one of the best natural regions in Indonesia, probably in the world: an archipelago of more than 60 islands with coral reef, white sand, and tropical rainforest. If people stop doing those practices, the reefs will recover and the fish come back—they are still many little fish moving around under Asrin’s house. In addition, the people are friendly and willing to work hard, if they are motivated. The key is the alternative income generation and the education of young generation. It takes time, patience, and money to work on them—I have the first two, hoping for the last one coming from the people who care about the nature and wildlife for our future generation to watch and admire.